Martha Berry is responding to Joyce Harriman's request for literature or examples from the Berry weaving department for her research. Martha Berry informs her that they don't have any literature (that they just use the standard old and common patterns). 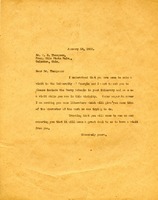 Letter invites the President of Ohio State University to visit Berry during his trip to Georgia and UGA. 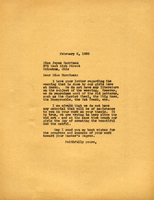 Martha Berry also is sending him some literature about the work of the Berry Schools.